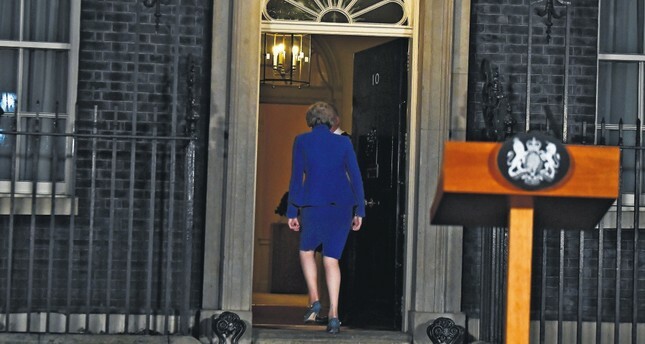 Britain's Prime Minister Theresa May leaves after making a statement following winning a confidence vote, after Parliament rejected her Brexit deal, outside 10 Downing Street in London, Britain, Jan. 16. The Brexit clock is ticking fast and the United Kingdom is still far from a political consensus and final road map to deliver on this contentious undertaking voted in by the people in 2016. Last week, history was made as U.K. Prime Minister Theresa May's Brexit deal was rejected in the House of Commons by 432 votes to 202 – a record margin of defeat for any government. However, as an indicator of the fractious and complex state of U.K. politics, May won the subsequent no-confidence vote propelled by Labour leader, Jeremy Corbyn. After the dust of the two tumultuous days in Westminster settled, the reality was that the U.K. was no closer to a deal that could satisfy all sides with mere weeks remaining. Unless the government can somehow muster an improved deal with the EU to appease the majority of parliamentarians or they extend Article 50 to allow more time to strike a deal, the harsh reality is the U.K. will leave the EU with no deal. Over the past few years, Brexit has been a source of division across the U.K., from the public to within the political parties themselves. After the comprehensive rejection of her deal, May sought to reach out to opposition parties in hope of reaching a parliamentary consensus. However, the dividing lines within her own Conservative Party are difficult enough to heal, let alone those with stubborn opposition parties, especially the Labour Party who has tried to manipulate Brexit from multiple angles to their advantage. Corbyn has repeatedly refused talks with May unless she categorically rejects the option of leaving the EU without a deal, a condition that May, so far, has flatly rejected. The Labour leader has continuously tried sitting on the fence, watching the Tory train wreck, and then capitalized on the political crisis that ensues. However, as May won the no-confidence vote, it serves as a reminder that any Brexit crisis does not necessarily equate to a snap general election or a new Labour government. After all, Brexit is an emotive debate that goes above political lines. The Conservative Party may be preoccupied with their own political civil war, but as comprehensive as the rejection of May's deal, Labour has simply not offered a serious alternative. For example, dozens of traditional Labour constituencies voted "leave" in 2016; there are also those within the Labour Party that support Brexit. Corbyn has to maneuver through his own land mines if he is to capitalize on any Tory crisis in any general election and not actually lose credibility among his own supporters. The Labour party must still seek a viable compromise between the leave and remain camps, and this goes back to May's difficult task of securing a truly amicable deal that can appease so many sides. If Corbyn does not accept the olive branch offered by May at this sensitive national juncture and compounds the national crisis with an inflexible posture, then this is not something that the public would quickly forget. Either way, the time has come for May to seek a cross-party consensus if any new deal is to win approval in parliament. Moreover, for that reality to emerge, May will need to remove or loosen her red lines. The sheer magnitude of the defeat of her deal suggests that cosmetic changes will be insufficient to win over hundreds of skeptical parliamentarians across the divide. So far, May, who has now survived two no-confidence moves in two months, has remained unwilling to budge but privately she will be left with little choice but to compromise with the opposition, both from within and outside her party, in order to fulfill her promise to deliver a Brexit. May is likely to reject growing cries to take the no-deal option off the table. After all, it has been her frequent motto, "no deal is better than a bad deal." Corbyn is pressuring May to backtrack on one of her key principles and replace this with "remaining is better than a bad deal" doctrine. In reality, the prospect of a no deal may be the few cards that U.K. has left to pressurize the EU into granting further concessions. The Leader of the House, Andrea Leadsom, echoed this view, and insisted that that a no-deal exit should remain the default position should no agreement be reached. Leadsom warned, "If we rule out no deal, we can forget about the EU taking us seriously. We weaken our negotiating hand." Meanwhile, Jacob Rees-Mogg, chair of the European Research Group, stated that a no-deal exit was better than May's deal, but May's deal was better than not leaving at all. Before appeasing opposition circles, May must firstly placate growing voices from within her party who are seemingly intent on delivering a motion that gives parliamentarians the power to block a no-deal Brexit or suspend the process altogether. Downing Street warned, "This news should serve as a reminder to those MPs who want to deliver Brexit that they need to vote for it – otherwise there is a danger that parliament could stop Brexit." May was already busy speaking to EU leaders on the phone and is likely to embark on a tour of Brussels in the coming days with one of her red lines firmly intact – the EU is staring down the barrel of a no deal Brexit that will not only be devastating for the U.K. but also for the EU. All this frenzied jockeying in Westminster as well as with Brussels begs the same question that has remained unresolved for almost three years – how do you execute a Brexit that delivers on the democratic will of the people, yet somehow does not burn the bridge with remainers and is acceptable to the EU? May has refused new calls to accept a customs union with the EU that for Corbyn is "necessary" for her to win a deal with the majority of the members of parliament. However, does the proviso of a continued customs union truly deliver on the Brexit promise? In addition, would that entail the continued freedom of movement that Brussels has long insisted must come with it but the U.K. rejects? Politically, the acceptance of a customs union would split the Tory party. It should be noted that while May's deal was rejected by remainers, it was also rejected by a substantial portion of Brexiteers, including key figures from within the Tory party that deemed May's deal as overly in favor of the EU. Then there is the prospect of a second referendum to decide the fate of Brexit. Yet again, this is hardly a conclusive path. What if the leave vote prevails again? Does a second referendum win really make the final deal with the EU or parliamentary consensus any easier? On the other hand, what if a remain vote triumphs this time? Just as the remain camp was defiant in the 2016 referendum, the leave camp is unlikely to go down without a fight if they feel that their original vote is unfairly overturned. In the end, even if there was cross-party consensus for the framework of a new deal, how do you navigate an actual agreement with the EU? The protracted and tense negotiations that led to May's December deal showed just how difficult any amicable agreement is.